Everything was going well for crypto investors until the big market crash in 2018. Bitcoin was worth around 19 thousand dollars and the total market cap was already over 800 billion dollars. The first cryptocurrency market drop from 800 to 200 billion dollars was a shock that made everyone flee the scene. The market suddenly went back to 400 billion, only to fall to the all-time-lowest 100 billion in the next couple of months. Here are 6 possible reasons why. Everyone suddenly started buying Bitcoin even though they knew little or nothing about it. Worldwide media built all the hype around Bitcoin, making the general public very interested in crypto business. Many people invested in cryptocurrencies only because other people did the same. They hoped to utilize the sudden growth of Bitcoin to get rich so much that it became a trend. Pessimistic mass media compared Bitcoin to tulip mania. Although the Bitcoin was still in the rise, people were hearing many malicious prognoses. For example, Bitcoin is like a bubble – it will pump up and then just burst. Investors started questioning their choices and being afraid of their assets. Some people with huge investments started selling their currencies which created more panic. The majority was holding to the HODL strategy – keeping their coins while hoping the price will rise more. They ended selling with loses. With the Bitcoin price dropping, everyone started selling their crypto assets with losses. Major companies such as Bloomberg, CNBC, Cheddar, acted as if they were right for their bubble analogy all along. They kept insisting that Bitcoin is collapsing and that it’s losing value just as was predicted. ICOs (Initial Coin Offerings) had a dual role in the Bitcoin events. These systems participated in the increase of the Bitcoin as well as in its collapse. Companies advertised ICOs in a way that made many people believe that ICOs were a fast way to get 10 times the return of invested money. It turned out that some people used the hype to perform scams. A Statis Group report claimed that 80% of ICOs were a scam in which investor ended up losing millions of dollars. People avoided investing in ICOs and became even more insecure. People who don’t know much about cryptocurrency trading and business tended to believe everything they hear. The stakes were high because it was their own money at risk. At first, everyone believed in the media hype and recommendations that investing in Bitcoin could make people rich very fast. Many investors weren’t interested in crypto business, they were only interested in getting rich. Therefore, when media shifted into claiming that Bitcoin was a bubble rather than a profitable investment, they decided to sell their assets together with big holders. 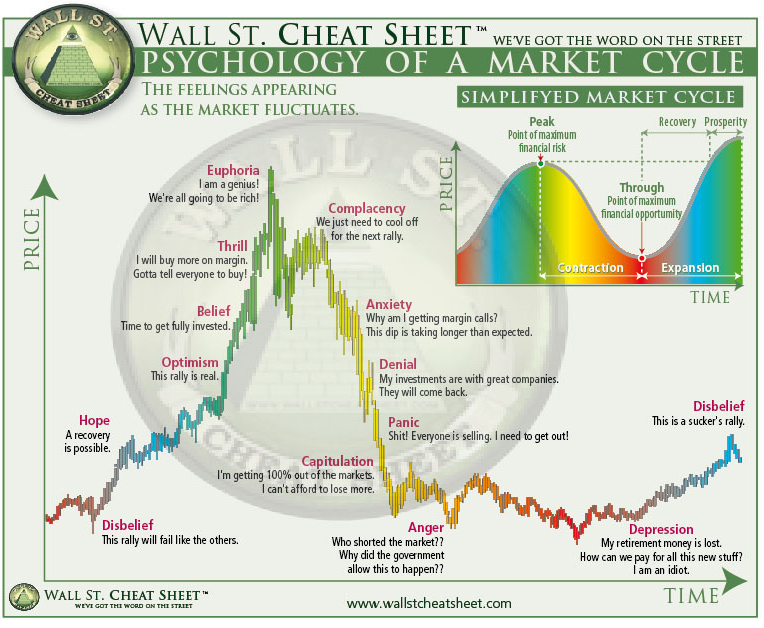 Market cycles are a common event in every trading niche. It happens in real estate business and stocks, and cryptocurrency as well. The great public hype for cryptocurrencies leads to the strong euphoria stage where everyone was grabbing their piece, just to end up greatly disappointed shortly after. Cryptocurrency fluctuation is inevitable, but this combined with all other reasons made this cycle happen faster than it should. When entering a new market, an investor should research everything about it. People who have been in that market for a longer period could also be very helpful. A good investor has the right knowledge, experience, and courage to judge on his own and not to fall under the effect of his emotions. From learning about the top trends, best cryptocurrency exchanges or simply following all of the daily crypto news That is a good way to avoid other people’s mistakes from these 6 points above and can save a lot of money that would otherwise be lost.